On the portable front, a popular portable infrared grill model is known as an "Ultrasear". It is similar in many wasy to the Solaire portable model, but at a pricepoint closer to $175. In exchange for giving up some features, burner control, and build quality, you can get a portable infrared gas grill at a rock-bottom price. 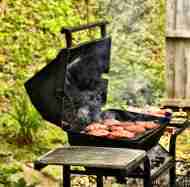 You may also find a variety of infrared gas grills under a various brand names. These units typically have both traditional burners plus an infrared burner configuration. This means that the main grilling surface uses traditional gas burners, but a side burner (or occasionally a rotisserie burner) is an infrared burner. Most of the models I have seen with this setup use the older ceramic-block style, which is an effective heat-source but may not be as durable and easy to clean and many of the more modern designs from the infrared grill market leaders. These combo units can sometimes be quite a bargain, particularly for buyers who enjoy the superior sear that only an infrared gas grill can provide, but also want the control and flexibility to cook "low and slow" over traditional gas burners. Expect to see more and more grills available with infrared grill burners, both as primary and specialty configurations. If you are interested in a model that isn't yet reviewed, please contact us so that we can add that information to our site.